The follicular adenoma is a benign tumour and is the most common tumour of the thyroid gland. It is encapsulated and the capsule is discernible both macroscopically and microscopically. The cells of the adenoma are organised into follicles which may be large (macrofollicular) or small (microfollicular). Solid or trabecular areas may also be encountered. Most follicular adenomas are not associated with a disturbance of thyroid function. However, a minority of them produce thyroxine in an autonomous fashion and will thus form a hot nodule on am appropriate nuclear medicine scan of the thyroid. Low power view of a follicular adenoma. A thick capsule is present. 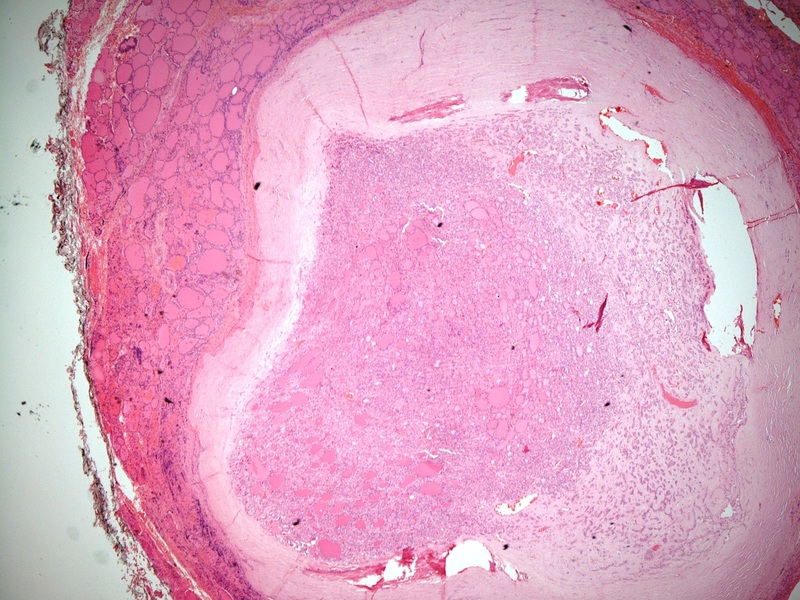 High power view of a follicular adenoma. Follicular carcinoma accounts for around 5% of malignant thyroid tumours. It average age at presentation is fifty years and the tumour is more common in women. 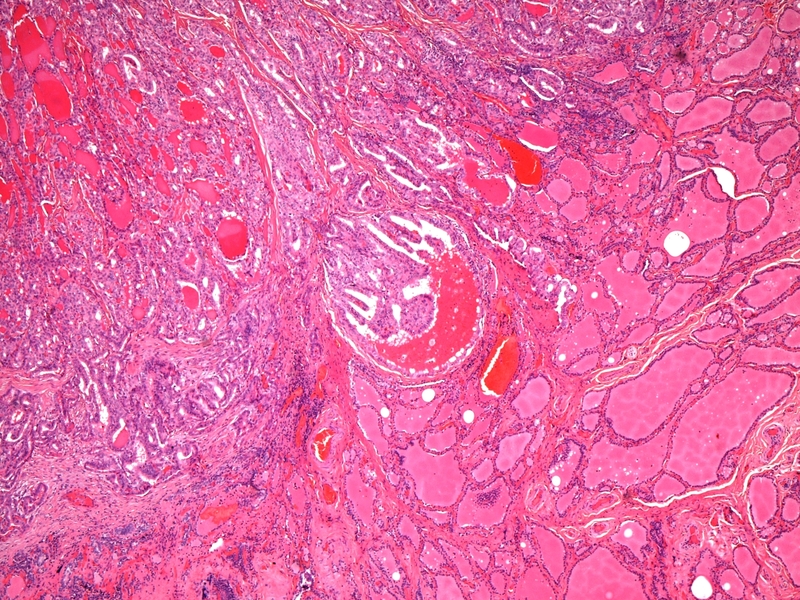 Although the cells of a follicular carcinoma can be arranged in follicular, cribriform or solid patterns, the only reliable way to distinguish a follicular carcinoma from a follicular adenoma is by the presence of full thickness invasion of the tumour through its capsule and/or vascular invasion beyond the tumour. The invasion of a follicular carcinoma may be focal and difficult to find (minimally invasive) or be widespread (widely invasive). The former tumours are particularly likely to resemble follicular adenomas closely whereas widely invasive carcinoma can have more divergent appearances. Nevertheless, transcapsular and/or vascular invasion remain the only two defining parameters that allow a follicular adenoma to be distinguished from a follicular carcinoma. Transcapsular invasion in a follicular carcinoma. The appearances of the follicles is otherwise similar to that of the follicular adenoma. 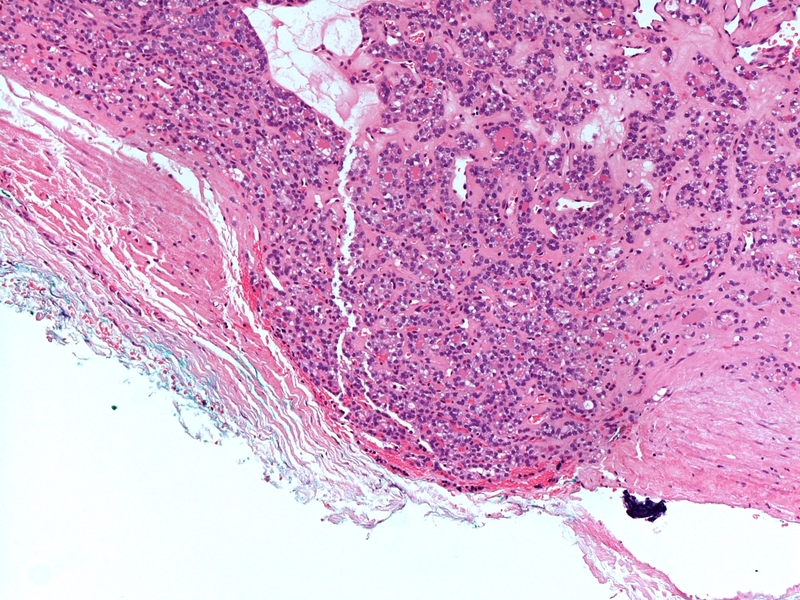 Unusually for a carcinoma, follicular carcinomas are said to eschew metastasis by the lymphatic route and instead spread far more commonly via blood vessels. The preferred targets are the bones and the lungs. Metastases are common in widely invasive carcinomas but affect only 5% of minimally invasive tumours that have vascular invasion and 1% of minimally invasive carcinomas that show only transcapsular invasion. Follicular carcinomas usually have reduced to absent thyroxine synthesis relative to the background thyroid gland and thus form cold nodules on radionucleotide imaging scans. Papillary carcinoma is the commonest form of malignant thyroid neoplasm and accounts for 80% of thyroid cancers. It is more frequent in women. The mean age at presentation is 40 years. 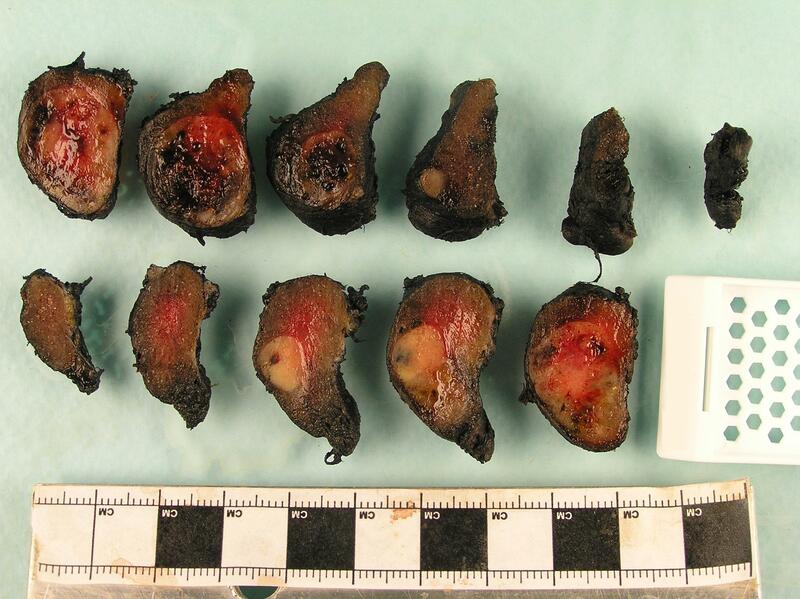 Papillary carcinomas tend to be unencapsulated lesions and may be multifocal. Some of the foci can be microscopic. In addition, small, unsuspected foci of papillary carcinoma can sometimes be encountered in thyroid glands that are removed for other reasons. Slices of a thyroid that contains a papillary carcinoma. 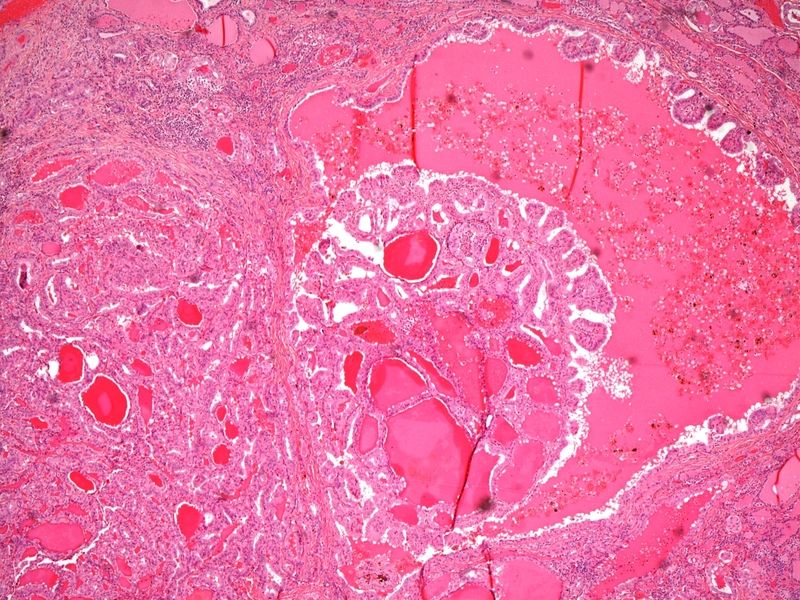 Haemorrhage and cystic change are present in the three slices at the left end of the upper row. Many papillary carcinomas have a microscopic architecture that is composed of papillary formations. However, despite the name of the tumour, papillary carcinomas can also display a follicular architecture. Furthermore, the defining features of the neoplasm are not the presence of a papillary growth pattern but are instead the demonstration by the tumour of several nuclear characteristics. Whatever the growth pattern of the tumour, the cells of a papillary carcinoma possess grooved nuclei. Some of the nuclei are optically clear (referred to as Orphan Annie nuclei after a cartoon character who first appeared in print in 1924). A few nuclei manifest cytoplasmic pseudoinclusions; these are an extension of the process which produces nuclear folds and occur in convoluted nuclei that contain invaginations of cytoplasm. The morphology of papillary carcinoma is further complicated by the existence of columnar cell, tall cell and clear cell variants. Papillary carcinoma spreads by the lymphatic system to local lymph nodes. More distant spread is to the lung. In addition to surgery, both papillary carcinoma and follicular carcinoma can be treated with additional radioiodine (131I). This is a radioactive isotope of iodine. It is concentrated by thyroid tissue, including that of the tumour and thus delivers a concentrated, focussed dose of radioactivity to the tumour, with sparing of the rest of the body. Radioiodine has the advantage that it can be absorbed by any metastases. Hurtle cell lesions are composed of cells which manifest Hurtle cell change (large cells that have abundant, granular cytoplasm and nucleolated nuclei). They are usually encapsulated and are light grey-brown. The majority of Hurtle cell tumours are benign. 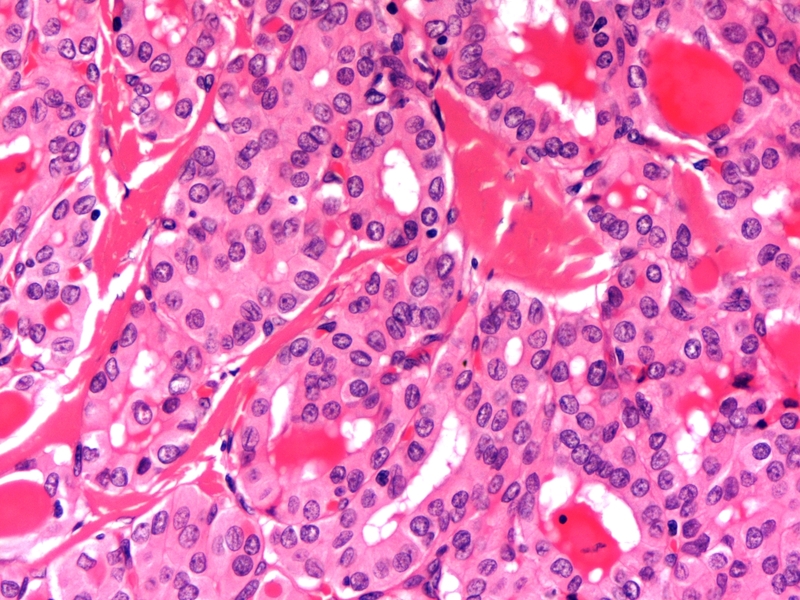 Unlike follicular adenoma, follicular carcinoma and papillary carcinoma, which are all derived from the follicular epithelial cells of the thyroid gland, medullary carcinoma is a tumour of the C cells and thus has neuroendocrine properties. Medullary carcinoma of the thyroid can be either sporadic or familial. The former group constitutes 80% of cases and has an average age at presentation of 45 years. The familial form presents around ten years earlier and is typically part of the multiple endocrine neoplasia type 2 (MEN2) syndrome. Sporadic tumours are usually single whereas familial tumours can be multiple and bilateral. Macroscopically the tumour is solid and firm. The cut surface is usually grey. Although the tumour is not encapsulated it is well circumscribed. The tumour cells are arranged in solid aggregates that are separate by a fibrovascular stroma that contains amyloid. The cells can adopt trabecular, nested, glandular or pseuopapillary formations. The constituent cells are ovoid to polyhedral and possess granular cytoplasm, although variant morphologies exist. Medullary carcinomas metastasise to the local lymph nodes. More distant sites are the lungs, liver and bones. 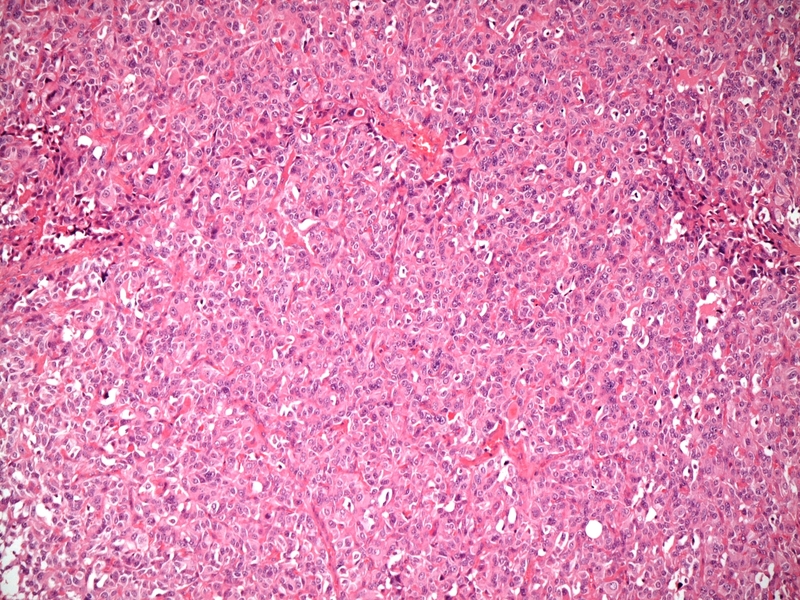 Low power view of a medullary carcinoma. The cells are arranged in large islands that are separated by bands of fibrous tissue. 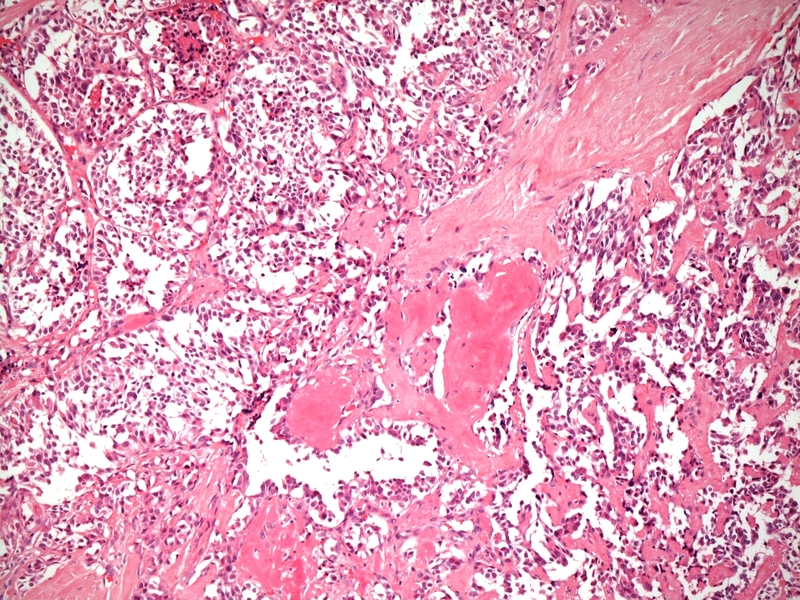 The clear spaces are artefactual High power view of a medullary carcinoma. The cells are grouped into small, closely packed nests. Anaplastic carcinoma is a high grade malignant tumour of the thyroid that tends to present in older people and does not show the female predominance that is encountered in follicular carcinoma and papillary carcinoma. 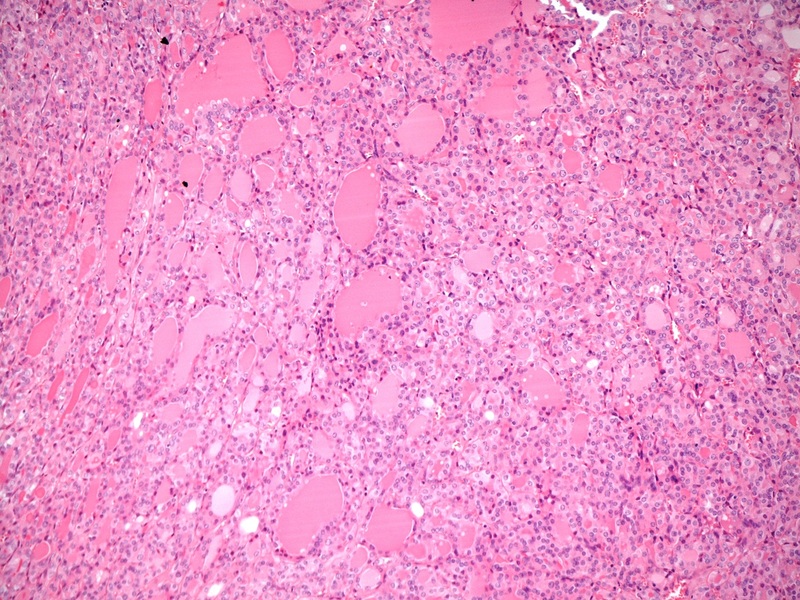 Anaplastic carcinoma is a rapidly growing tumour that is haemorrhagic and necrotic. It infiltrates extensively into the adjacent extrthyroid structures. The microscopic appearance of an anaplastic carcinoma features epithelioid and/or spindle cell forms. 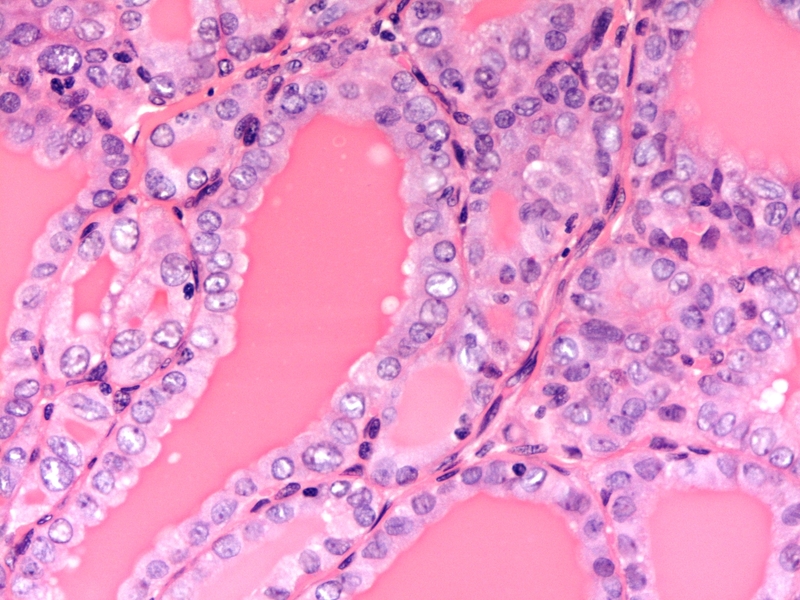 Carcinomas of the thyroid is staged by the TNM system (sixth edition shown below). All anaplastic carcinomas are defined as being stage 4. Stage 4a anaplastic carcinomas are confined to the thyroid gland; stage 4b anaplastic carcinomas invade beyond the thyroid gland (and are considered not to be surgically resectable). The common presenting complaint of the various types of thyroid tumours is a neck mass or goitre. The mass will be located in the anterior midline of the neck and will move upwards on swallowing. Large goitres can compress the oesophagus and produce dysphagia. The trachea is more resistant to compression, but some tumours, especially anaplastic carcinomas, can compromise the trachea and yield dyspnoea. Invasion of the recurrent laryngeal nerve is unusual but will produce a hoarse voice. Disturbances of thyroid function are uncommon. A minority of follicular adenomas may secrete thyroxine autonomously and induce hyperthyroidism. Rarely, a large tumour may destroy a sufficient quantity of the normal thyroid gland that hypothyroidism results. Despite the potential for the production of calcitonin by medullary carcinomas, hypocalcaemia seldom results. The investigation of a thyroid neoplasm is centred around determining the nature of the neoplasm. Blood tests have little role in the diagnostic process; thyroid function tests may be performed to check that neither hyperthyroidism or hypothyroidism has not developed. Further blood tests may be undertaken if surgery is contemplated. An FNA can usually determine the general nature of a thyroid mass. Distinction between a follicular adenoma and follicular carcinoma is not possible on FNA and both will yield features that are reported as a 'follicular lesion'. Imaging of the neck and likely metastatic sites is used to stage the tumour and also to assist in planning surgery. Ultrasound scans are useful in the evaluation of the thyroid and any nearby lymph nodes but CT scans are necessary for full staging and assessment of the local surgical anatomy. Surgical excision of the tumour is the mainstay of treatment. Either a lobectomy or total thyroidectomy is performed; the choice depends upon the nature of the tumour and its size and location. Occasionally a papillary carcinoma will not have been diagnosed as such before surgey and a lobectomy will be undertaken. In such cases the remainder of the thyroid is removed in a second operation. Radioiodine (131I) can supplement surgery for follicular and papillary carcinomas. The radioactive iodine is concentrated in the tumour and thereby targets the radiotherapy. Complete surgical excision is curative for benign tumours. Papillary carcinoma and follicular carcinoma generally have a very good prognosis. The prognosis of anaplastic carcinoma is very poor.